Developer	 Modern Green Development Co., Ltd. 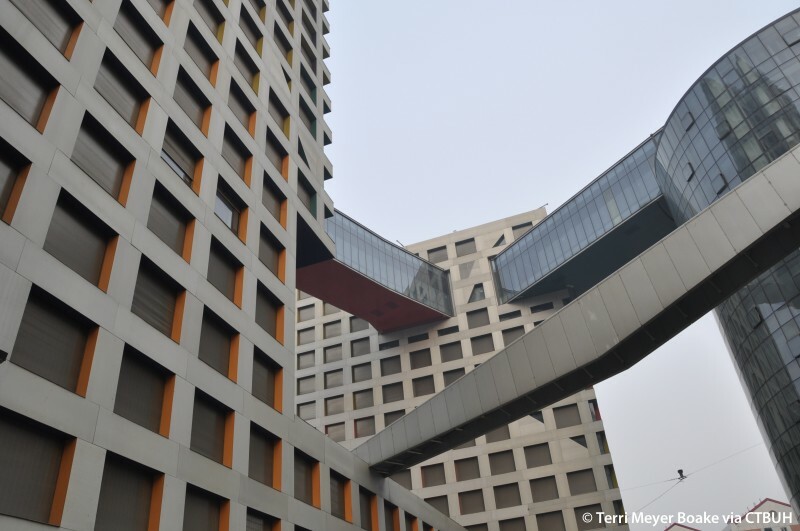 The pedestrian-oriented Linked Hybrid complex, sited adjacent to the old city wall of Beijing, aims to counter current urban developments in China by creating a new twenty-first century porous urban space, inviting and open to the public from every side. A filmic urban experience of space; around, over and through multifaceted spatial layers, as well as the many passages through the project, make the Linked Hybrid an “open city within a city”. The project promotes interactive relations and encourages encounters in the public spaces that vary from commercial, residential and educational, to recreational; a three-dimensional public urban space. The project exists on three levels. The ground level offers a number of open passages for all people (residents and visitors) to walk through. These passages include “micro-urbanisms” of small scale shops which also activate the urban space surrounding the large central reflecting pond. All public functions on the ground level—including a restaurant, hotel, Montessori school, kindergarten, and cinema—have connections with the green spaces surrounding and penetrating the project. On the intermediate level of the lower buildings, public roof gardens offer tranquil green spaces. The central roof garden features an open design to reflect the architectural structure of the cinematheque. At the top of the eight residential towers private roof gardens are connected to the penthouses. Elevators displace like a “jump cut” to a series of passages on a higher level. From the 18th floor a multi-functional series of skybridges with a swimming pool, a fitness room, a café, hotel bar, and an art gallery, connect the eight residential towers and the hotel tower, and offer views over the city. 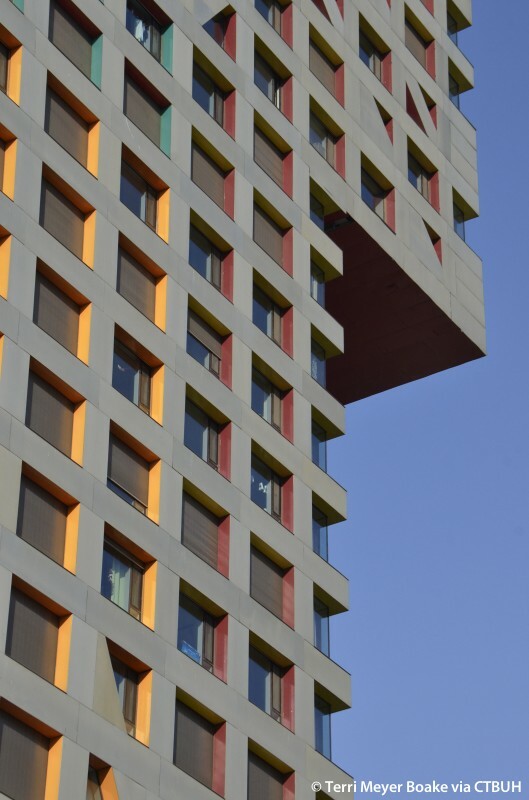 The shops at the grade level are complimented by the programs at the bridge level and work together to be semi-lattice-like rather than simplistically linear. 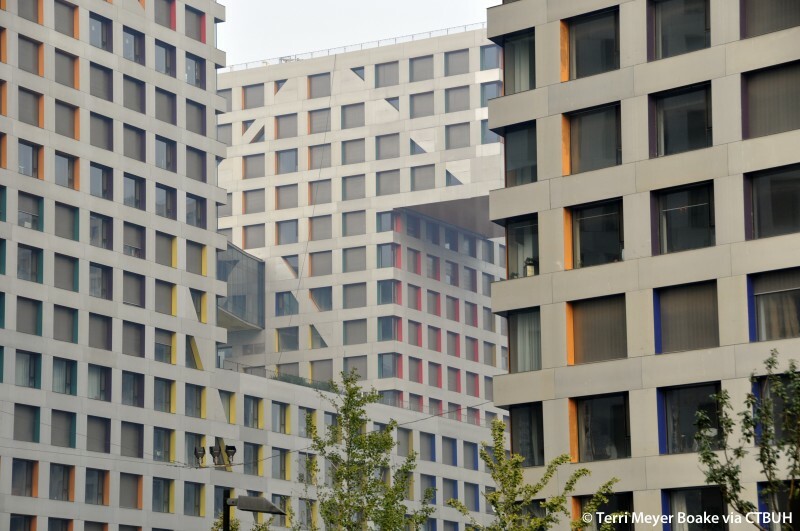 The complex aims to achieve a programmatic self sufficiency of amen-ities for residents. By bringing diverse programs together both on the ground floor and in the bridges, the project stresses ambulatory circulation. 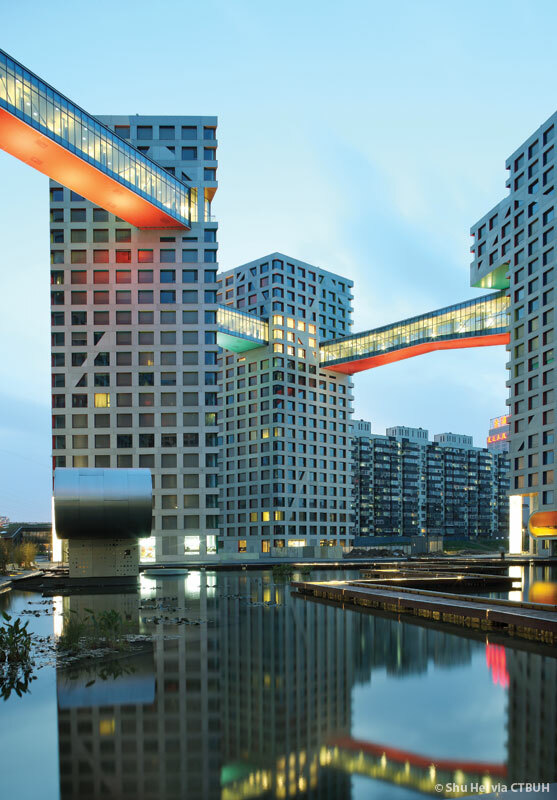 Rather than skybridges that drain street life, the aim is for a base route and sky route that will constantly generate random relationships like the richness of metropolitan density; functioning as social condensers in a special experience of city life to both residents and visitors. In proposing the sectional variety of Linked Hybrid, the aim is for new “Z” dimension urban sectors that aspire to individuation in urban living while shaping public space. In the experience of traversing the bridge route, one feels the urban excitement of the passage of the body through space. Movement, spatial sequence and time of day with different light are intertwined. The point of view changes with a slight ramp up, a slow right turn, or a stop to gaze at the distant urban view. The encircled route connects the towers in a new collective aspiration—different from towers as isolated iconic objects. 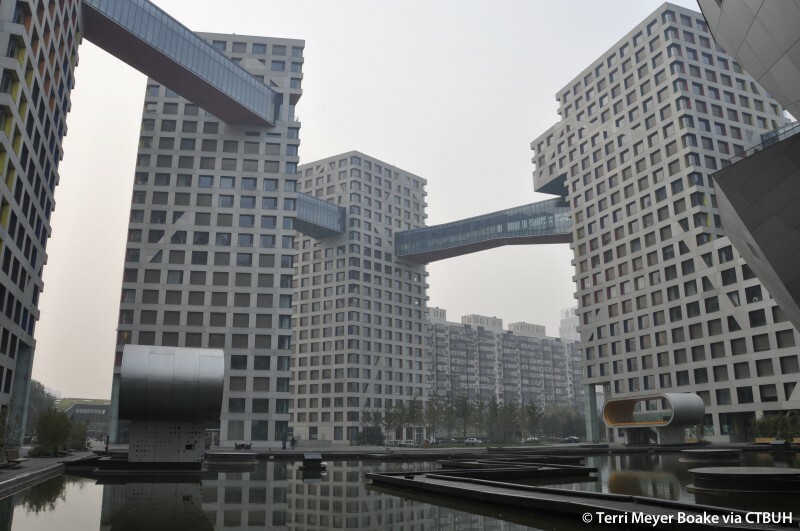 The context of this new linkage is the increasingly privatized and objectified nature of recent Beijing developments. 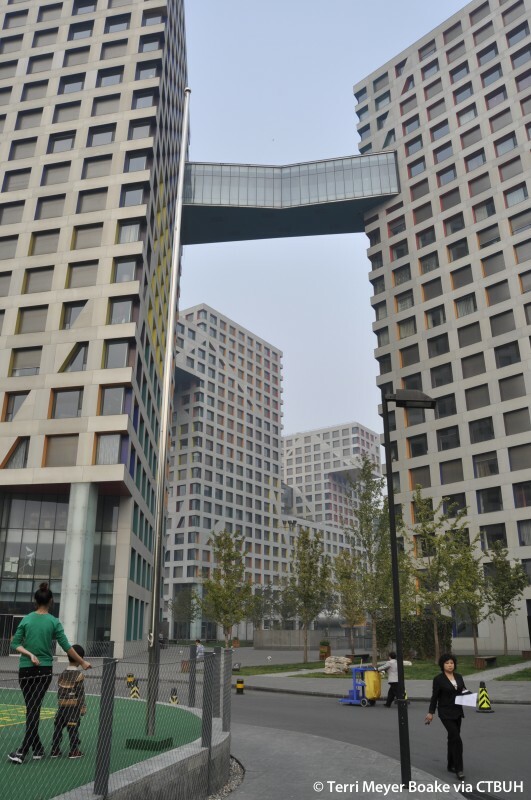 Geo-thermal wells—660 in number—at 100 meters (328ft) deep, provide Linked Hybrid with cooling in summer and heating in winter, and make it one of the largest green residential projects in Beijing. About 70% of the heating and cooling load is covered by the geothermal system throughout the year. Using this closed-loop system saves a calculated 5600 KW in energy during summer and 3700 KW in winter. The large urban space at the center of the project is activated by a grey water recycling pond with water lilies and natural grasses in which the cinematheque and the hotel appear to float. The pond is part of a total project grey water recycling system, which connects all apartments to a main ultraviolet filter tank system and with distribution watering all landscape gardens and roof gardens. 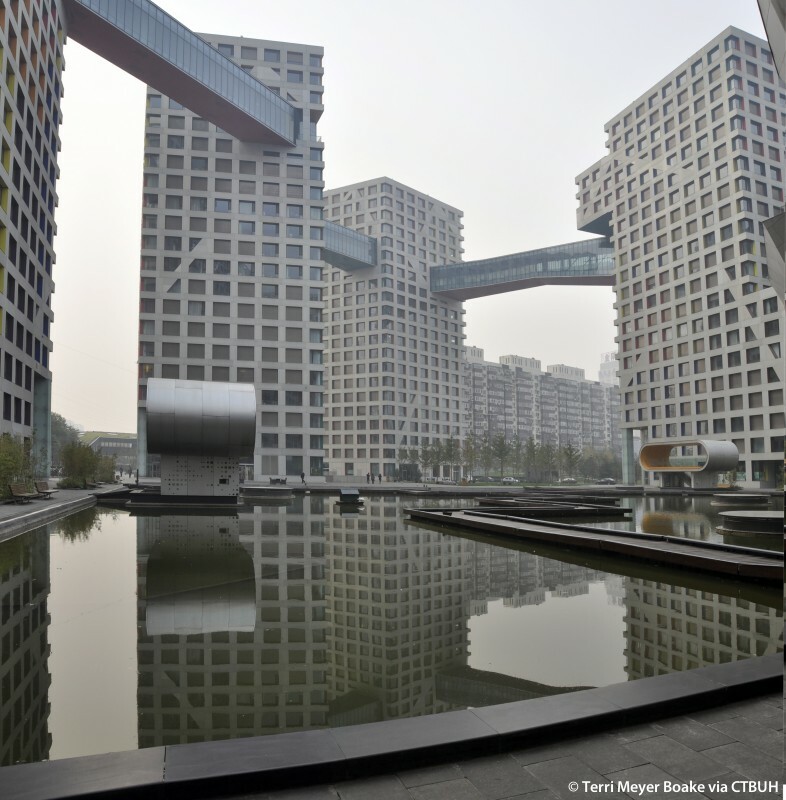 In Beijing, where water shortage requires urgent measures, Linked Hybrid sets a new example as a total ecological urban sector with living, working, cultural, and recreational facilities operating from the same sustainable systems of water recycling and geothermal cooling and heating. In the winter the pool freezes to become an ice-skating rink. The cinematheque is not only a gathering venue but also a visual focus to the area. 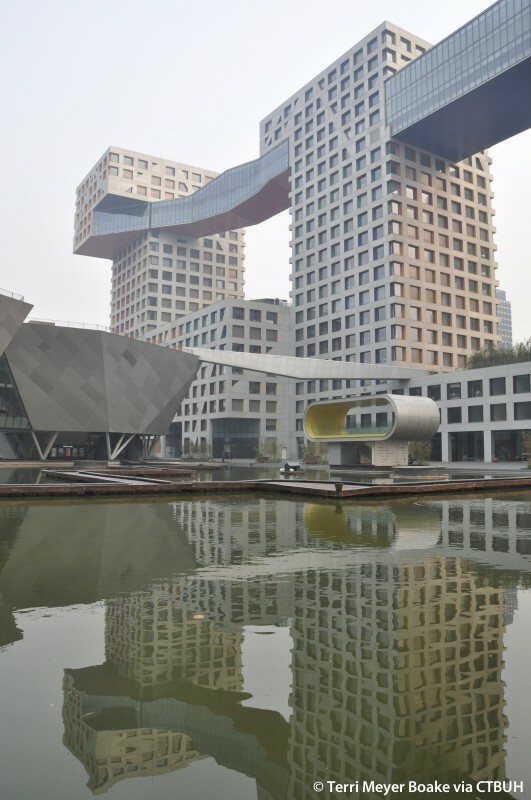 The cinematheque architecture floats on its reflection in the shallow pond, with its exterior wall capable of projecting films, adding vitality to the community. Its first floor is left open to the community, with views over the landscape surrounding the building. The three film projection halls will be occupied by Broadway Cinema from Hong Kong. The polychrome of Chinese Buddhist architecture inspires a chromatic dimension. The undersides of the bridges and cantilevered portions are colored membranes that glow with projected nightlight. Based on chance operations of the I-Ching, the window jambs and heads have colors found in ancient Chinese temples. 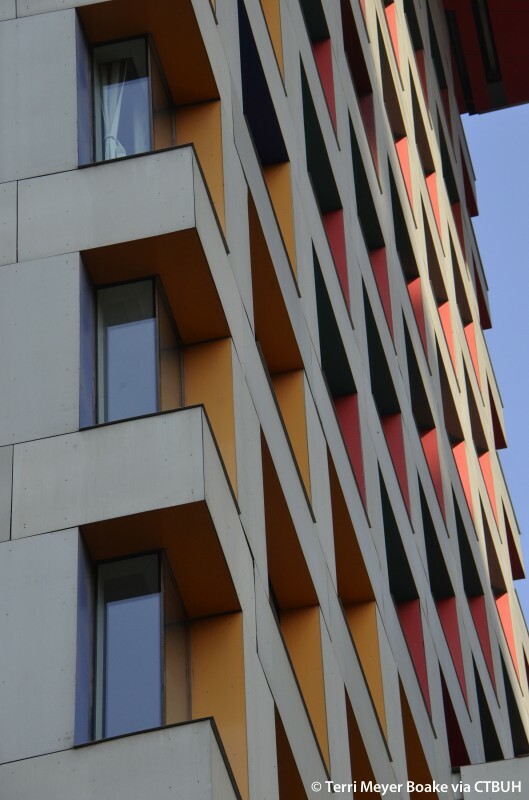 The façades are monochrome revealing their colors in the parallax views of movement around or looking up. An exoskeletal concrete frame with insulation and sanded aluminum skin is utilized throughout with lateral earthquake bracing exposed in the gridded structural wall. This allows maximum flexibility for interior apartment layouts while establishing the space. A basic model apartment was designed with “hinged space,” in which rotating walls allow loft-like open apartments with long diagonal interior views. Spaces are connected by visual perspective, from one room to the next. Re-using the earth excavated from the new construction, five landscaped mounds to the north contain recreational functions. The “Mound of Childhood”, integrated with the kindergarten, has an entrance portal through it. The “Mound of Adolescence” holds a basketball court, a roller blade and skate board area. In the “Mound of Middle Age” there is a coffee and tea house (open to all), a Tai Chi platform, and two tennis courts. The “Mound of Old Age” is occupied with a wine tasting bar and the “Mound of Infinity” is carved into a meditation space with circular openings referring to infinite galaxies. At the Linked Hybrid project, the idiosyncratic changes of new users and adjustments according to taste are already visible—life at the urban scale goes on—but the hope of shaping new public space with Hybrid Buildings of “Z” dimension experiences remains a core intention. 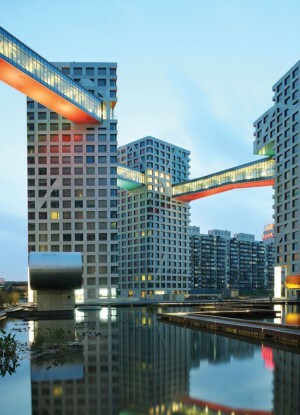 The overlapping perspective thrill of walking the skybridge route is matched by the amazing porous sense of urban enclosure while walking within the public space at grade. The magical night time up-lighting on the bridges reflected in the central pond are phenomenal experiences which cannot be photographed—they must be felt via the body in space.